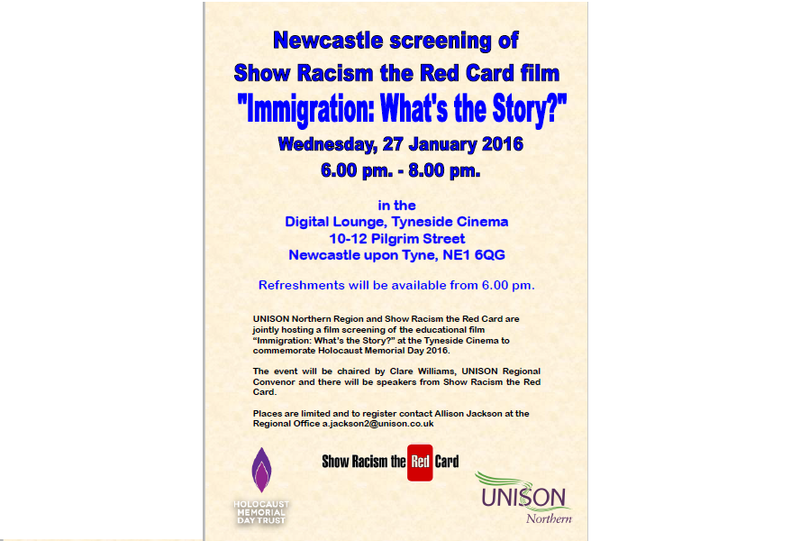 UNISON Northern and Show Racism the Red Card are hosting a screening of the new educational film ‘Immigration – What’s the Story?’ in the wonderful Tyneside Cinema, Newcastle-upon-Tyne on Holocaust Memorial Day, 27th January 2016 at 18:00. The event will be chaired by Clare Williams, UNISON Regional Convenor and will feature guest speakers, including SRtRC NE Education Manager, Laura Pidcock and John Ameobi who appears in the film. ‘Immigration – What’s the Story?’ will be released as part of a collection of films by SRtRC, including SRtRC Scotland’s ‘This is My Home’ in 2016.